2016 was the first year that I used a model to predict point spreads, as my previous models focused on win probabilities (see this article for more details on my win probability models). Aside from using predicted point spreads to fill out a bracket, another use is for comparison to the lines in Vegas. For instance, if my predicted spread for a game favors a team by 10 points, but the Vegas spread has that team favored by only 2 points, the model indicates that team should cover the 2 point spread more often than not. Including all tournament games, my spreads finished exactly 50% against the Vegas spread (ATS), but if we only consider games in which my spreads differed from Vegas’s by at least 4 points, they finished 15-10 ATS (60%), which means betting $110 on all 25 of those games would result in a profit of $400. The chart below compares my spread, Vegas’s spread, and the actual result for all of the second round games from 2016. While it is convenient to compare results from a win/loss standpoint, there are always other things to consider beyond the numbers. If a team’s star player is sitting out, do you still trust the model’s prediction? Situational factors such as injuries, amount of rest, travel distance, or recent trends not fully reflected in the data can all have an impact on the result. 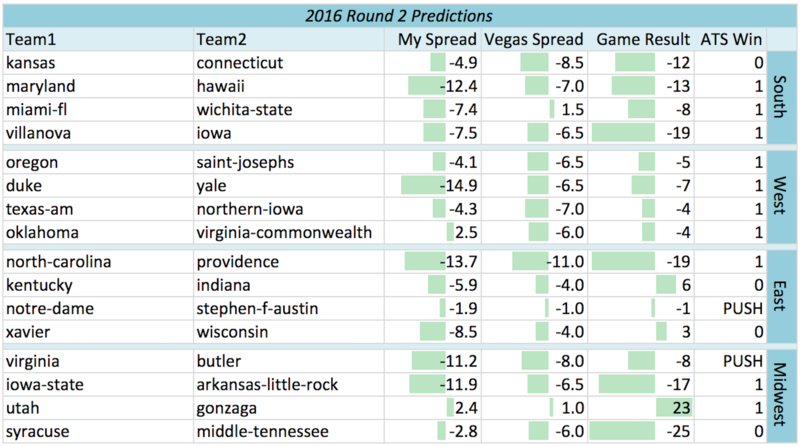 Furthermore, if my predicted spread is extremely close to the Vegas spread (such as the Notre Dame vs. SFA game in the chart above), one number being “better” than the other becomes less definitive.